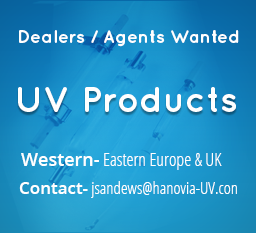 “Hanovia has been manufacturing UV Lamps, Power Supplies, Reflector Assemblies and Curing Systems since 1905. A long term member and supporter of RadTech and the SGIA, Hanovia is a global manufacturer providing equipment to the printing, coating, and adhesive industries. Hanovia also produces photochemical equipment consisting of turn key systems, and custom designed systems used in the pharmaceutical and fine chemical industries. Hanovia also manufactures industrial based air/water sterilization products and photoluminescent pigment/vinyl products used in the safety, education and novelties markets round out the product mix”.